A lioness rests in the shade on a warm African morning, keeping a close watch over the other members of her pride. For the past 3 weeks, I have been in South Africa on a @stanfordbosp conservation photography program learning about the unique wildlife conservation challenges facing the species in the continent’s southerly region. Thanks to the incredible guidance of @susankmcconnell @pumapix and @jgmason along with the many conservation stakeholders that I met along the way, my time in Africa opened my eyes to a new world of conservation that I cannot wait to share with all of you. Though the image of African conservation is present in the minds of many, I have learned that there is far more complexity and depth to the stories of Africa’s threatened ecosystems than many of us are aware. In the coming weeks, I am excited to share a few of those perspectives, stories, and experiences with all of you in hopes of starting conversations around the unique challenges of conservation that are currently playing out on the South African landscape. When many picture African wilds, the image of vast, untouched savannas often comes to mind. Though parts of Africa still retain the classic image, nature in much of South Africa takes on a different form. Large portions of the country’s landscape and wildlife are privately owned, segmented by mazes of fence line that dot the terrain. With the recent escalation of both tourism and conservation in South Africa, many wealthy landowners looking to boost their investments have converted what was once ranch land into much needed game habitat. Though the cattle are gone, the aura of ranching lingers on the reserves. The animals are confined by fences into heavily human-controlled landscapes where federal law designates wildlife as property to be bought, sold, and traded. 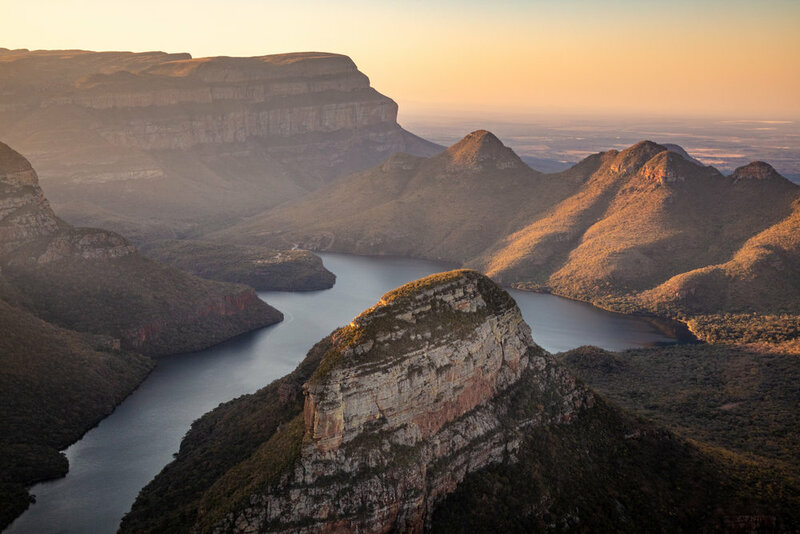 Though the commercialization of nature challenges the historic principles of wilderness held by many, these private reserves have emerged as a crucial part of South Africa’s fight to save the continent’s rapidly disappearing species. Around the world, the primary conservation story surrounding elephants is the ivory trade and poaching crisis that is killing these beautiful giants at a shocking rate of 4-5 per hour. In South Africa, however, elephants are struggling for a very different reason. The prevalence of man-made fences, from the borders of the massive Kruger park to the dividing lines of private reserves, constrict wildlife and prevent the vital process of migration. When unable to move long distances, historically small populations of elephants overgraze plant species that have no hope of regeneration, and populations cannot expand to desired numbers. In the confines of fences and man-made barriers, ecosystems lose their self-sufficiency and human influence is a necessity. Conservationists and landowners are now faced with the dilemma: mitigate population growth of a vital species that is rapidly disappearing on the rest of the continent, or lose the ecosystem. In the wilds of Africa, there are no easy answers. Maintaining balanced natural environments in a human controlled landscape is one of the most challenging tasks that humans are now responsible for. Management of “umbrella species” cause an ecological and economic cascade through entire ecosystems. Elephants for example, spread seeds, fertilize soils, and clear the landscape for newer and healthier generations of plants - but more than just plants are impacted. Species like this Lilac-Breasted Roller, one of Africa’s most famed birds, depend on the combination of taller shrubs and grasses that allow them to perch up high and hunt for insects below. If there are not enough elephants, shrubs dominate the landscape, but if there are too many, only grasses survive. With so many interconnected species, the stakes are high. When one species falls out of balance at either end of the population spectrum, the entire savannah feels the change. My encounter with this female black rhino, who goes by the nickname “Dot”, was one of the most special and profound moments of my life. Dot wandered calmly through the grasses and shrubs with a joyful spring in her heavy step, oblivious to the uncertain future of her species. Our group shared this special moment as we watched in awe of the wild creature whose kind has roamed the African landscape for millions of years. “5-6 years” our guides said, referring to how much time is left save Africa’s rhinos before they face extinction. My eyes filled with tears as I was hit by a wave of overwhelming feelings of gratitude, sadness, and anger, but also responsibility as I realized that my generation could be the last to live on a planet with rhinos. Black-market demand for rhino horn in Eastern Asia has caused prices to skyrocket higher than diamonds, giving traffickers the power to take advantage of poor community members who get tangled in poaching as a means of survival - yet the product is no different than a human fingernail. As rhino conservation reaches a critical stage, fenced private reserves that value living rhinos from an ecotourism perspective are part of a complex and multi-faceted fight to save rhinos while demand remains high. 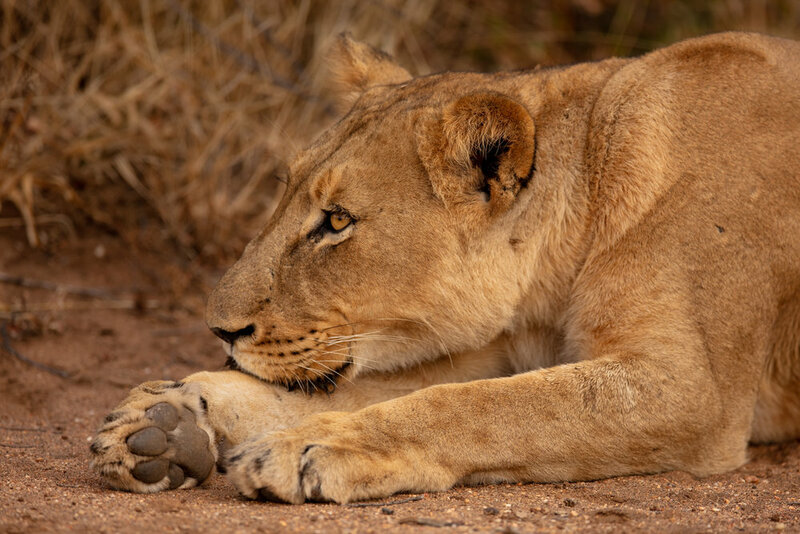 As the iconic “king” of Africa, lions present a challenge to reserves as a result of their tremendous influence over both economic and ecological webs, mixed with their novel overabundance in South Africa. Unlike threatened populations in other parts of Africa, lions in South Africa's fenced environment quickly reach carrying capacity with increased life expectancy and short gestation. Historically, lion numbers were limited by conflict from distant prides and rogue males, but with fences abound migration has become impossible. Humans must now find a way to ethically control the population of an otherwise threatened species. 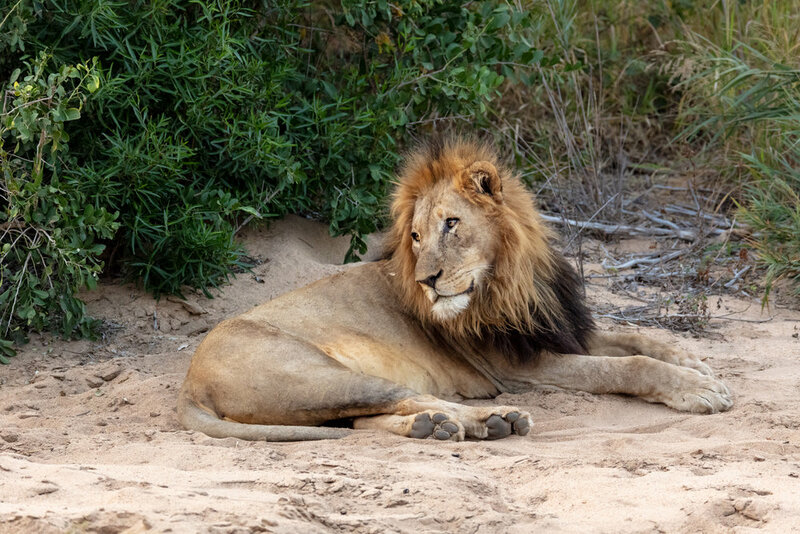 Kalahari Junior, the male lion pictured, is the son of a large male (Kalahari) who was traded between reserves in an attempt to mimic migration by introducing territorial conflict and re-kindling lost genetic diversity. Kalahari did just that. He passed on new genes and fought other lions to become a dominant force on the reserve. Soon after Kalahari Junior came of age, a coalition of males killed his father to take over the pride and rather than live under their reign, Kalahari Junior fled to live as a solitary male. Today, the cycle continues as Kalahari is following in the footsteps of his father and rising to become a new “king” of the reserve. Though artificially introducing conflict in lion populations seems harsh, it is just one of many unsavory strategies that reserves must face to maintain a balanced ecosystem in today's world. 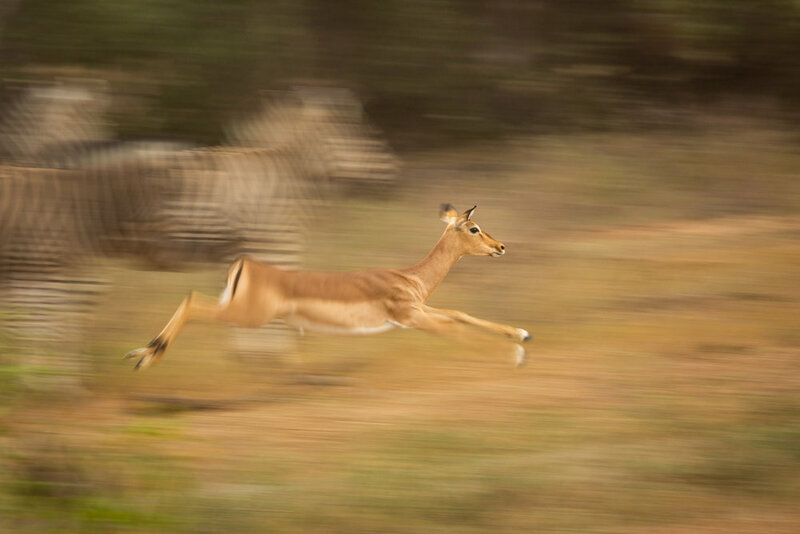 A small female impala leaps through the air, spooked by the threat of nearby predators. Among the most important parts of a healthy ecosystem is the predator-prey balance, yet the equilibrium can be easily thrown-off when ecosystems are constrained by humans or species go extinct. Though fenced ecosystems lose their ability to be self sufficient, nature is complex and it is impossible for humans to dictate the population of every single species. Instead, people must focus on the species that have the biggest impact on the ecosystem - lions and elephants. By monitoring the abundance of the top carnivores and top herbivores, humans have taken the wheel of the ecosystem, steering everything from the populations of giraffes and impala to the populations of insects and plants. Many natural places around the world remain unfenced and unmanaged by people, but growing and expanding human populations mean that humans will be increasingly responsible for guiding the balance of nature. As someone who sometimes passes out at the sight of blood, a leopard guarding an impala carcass was a harsh sight for me, but one that I am tremendously grateful for because of its representation of the functioning of a delicate dance between landowners, tourists, conservationists and the circle of life on the savannah. Seeing one of the world’s most persecuted cats being protected and treasured in its wild state made me hopeful. Leopard, Lion, Elephant, Rhino, Buffalo - the “big 5” are the centerpiece of South Africa’s 9-billion-dollar tourism industry and conservation effort. Millions of visitors come from all corners of the globe with the dream of seeing all 5 of the continent’s fabled few. These tourist preferences directly influence landowners who get more return on their investment if their land provides habitat for the species that bring visitors. Fortuitously for conservation efforts, tourism dollars that the icons generate ensure that conservation reaches each step of the circle of life - a cycle that the big 5 cannot exist without. Conserving leopards, for example, means that several species of antelope as well as diverse scavengers (that do not attract the same public attention) have a healthy population, habitat to roam and food to survive. Although an unbiased desire to protect wildlife is not the priority of some landowners, diverse ecosystems are a surprising product of a system that has created economic value from protecting otherwise forgotten or persecuted species. Not all species that draw tourism to South Africa are members of the fabled "big 5". Though closely related to common domestic species like donkeys or horses, zebra are one of the most striking and exotic sights to many foreign visitors - serving as a visual ambassador to the marvel of Africa’s striking diversity. The black-and-white stripes that make zebra so unique are more than just a visually mesmerizing decoration, though their purpose is still elusive. Until recently, it was assumed that the flashy appearance was a of camouflage to confuse leopard, lion, or cheetah, but there has been no evidence to show the stripes decrease predation. In fact, some now think that the high-contrast stripes make the zebra more visible in its environment. One newer theory claims that the stripes could help keep the plains-dwelling animal cool in the hot sun by causing air to flow over the zebra’s skin. Another believes the alternating colors keep disease-carrying insects from biting. Whatever the answer may be, the intricate mystery of the zebra’s stripes remains unsolved. The waters of the Blyde River glow in the afternoon light like an oasis among the dry plains that lay beyond. Winter is the dry season in South Africa and ensuring there is enough clean water for wildlife and people is intricate. During dry-spells, wildlife historically migrated, searching for natural watering holes and wetter climates where there are sufficient grasses to feed on. With fences, roads, and villages surrounding parks, such migrations are no longer possible. In the past, the solution was to add artificial water for animals, but this “fix" brought both ethical and environmental problems. From an ethical standpoint, the issue comes from the fact that animals are ensured sufficient water while poor neighboring villages - many of which were moved off of their lands to make way for the parks themselves - are largely forgotten or ignored. Artificial water sources are also often counterproductive to conservation because during droughts, the leading cause of death is starvation from lack of grasses rather than from dehydration itself. When watering holes are put in place, wildlife congregate unnaturally, leading to greater predation of the herbivores that would have been impacted by the drought in the first place. Today, parks like Kruger focus more heavily on the cleanliness and natural flow rivers, but with the livelihood of both people and animals dependent on rivers, maintaining coexistence among stakeholders is an ongoing learning process. Looking into the eyes of a giant 13,000 pound elephant has a way of making you feel small... When most animals are depicted in movies or TV shows, their size is almost always exaggerated, making them seem much smaller in the wild. For elephants, however, no camera could ever show just how giant they truly are. When sitting in a 6-foot tall vehicle that is dwarfed by even the smaller members of a herd, it is impossible not to have an appreciation for their power and beauty. Just as standing at the base of a melting glacier makes it hard for humans to comprehend the scale of our impacts, standing at the feet of an African elephant evokes the same sense of bewilderment. Yet despite being small as individuals, our footprints, for better or for worse, are changing the world. Though it is hard to imagine that humans could impede the movement of elephants, control their access to food and water, and ultimately dictate their survival, that is exactly what conservationists, local communities, poachers, hunters, and tourists are all doing. The survival of earth’s largest land mammal is a responsibility that as humans, we all share. The golden orb of the setting sun casts a final sliver of light onto a passing giraffe as the shadow of night sweeps over the savannah. The South African ecotourism model benefits many reserve owners, tourists, and conservationists, but one key stakeholder is often left in the shadows on the other side of the horizon. Just over the hills lies a sprawl of poverty-stricken communities that have been both physically and psychologically excluded from their wild landscape since the fences went up decades ago. Some of the most diverse wild-lands on the planet exist just beyond a fence-line, but many locals go their entire lives only able to experience the wildlife through stories brought back by privileged visitors. Segmenting wildlife with fences and marketing to foreigners has been proven to buoy conservation and boost the economy, but in the process, the vital understanding between people and nearby species has been consigned to those from far-away. A connection between locals and neighboring wildlife is a missing-link for conservation in South Africa and around the world. A large bull elephant plays around with his trunk, spraying water around before taking a large sip. The trunk of an elephant is one of its most valuable tools that can be used as a nose, a hand, a straw, and even a snorkel. Elephants drink water by sucking water into their trunks, but just as humans can’t drink through our noses, elephants can only use the trunk as a way to transport water to their mouths instead of pulling the water all the way through. When the trunk is full of water (which may be up to 10 liters in a single sip) they blow air through it to spray the water into their mouths. Rather than trying to dip down into the water to drink, the long trunk makes it so that the elephant can efficiently get water to their mouths while remaining upright. Being the large mammals that they are, elephants require a huge amount of water to survive. On average, a single African elephant will drink 190 liters (about the volume of a bathtub) each day. The southern yellow-billed hornbill is one of southern Africa’s most recognizable and charismatic birds. With their long and curved toucan-like beak that nearly dwarfs their own body, the yellow-billed hornbill is often nicknamed the “flying banana”. Though the giant size of the beak seems like a strangely unnecessary adaptation, it was recently discovered that hornbills and other large-beaked birds use the beak as a way of regulating temperature. Just as dogs pant and humans sweat, many species have their own unique ways to keep from overheating. Since parts of Africa can be hot and dry during certain times of year, the monstrous beak adds extra surface area that can release heat and keep the bird cool in the hot African sun. A white rhino rests peacefully in the shade on a warm sunny morning. Being in the presence of a wild rhino is a special experience regardless of where you come from. For people around the world who adore rhinos, it is hard to empathize with those who poach or demand the horn of such endangered animals, but every story has another side worth listening to. Most poachers come from impoverished bordering communities, never having had the opportunity to appreciate the living rhinos beyond the fences. When a rhino trafficker promises a relative fortune in exchange for a poached rhino, individuals often make the decision to sacrifice an animal they have never seen with hopes of saving loved ones or themselves. In Asia, where rhino horn is demanded, a belief in the powers of the horn is deeply embedded in culture. Living rhinos and their struggles are oceans away, but cultural beliefs are always close by. Education is helping to create new cultural values surrounding rhinos, but changes may take generations. Though the solution remains elusive, saving rhinos will require bridging conflicting perspectives, ensuring a peaceful coexistence for people and rhinos alike. 2018 is a big year of traveling as I photograph nature and conservation in some of Earth’s most critical lingering wild landscapes. Follow me as I post stories of the unique animals and landscapes I encounter and the challenges they face in the global conservation effort. From Stanford to Wyoming, and on to Africa!